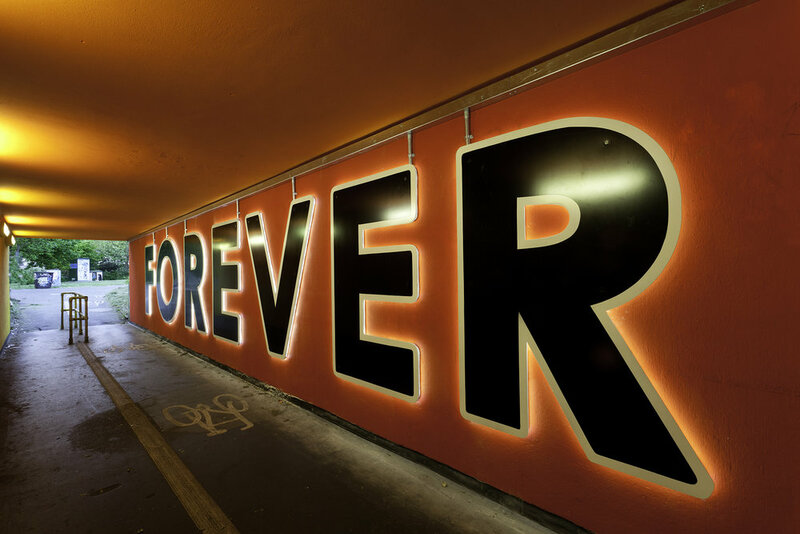 This was commissioned by Bristol City Council in 2012, to be sited in two pedestrian subways on the edge of the Easton/St Paul's districts of the city. The area has a high level of politically active groups and one of the problems that the council wanted to address was the constant graffiti and fly-posting in the subways. The council had put up a temporary noticeboard between the subways to advertise the proposed redevelopment of this area and this was instantly adopted by the residents to use it as a notice board. So this was something I incorporated in to the finished work. This became another in the 'Free For All Forever' series of works, other examples of which can be seen on this website. This project, along with many other commissions around Bristol can be seen on the Art and The Public Realm Bristol website.